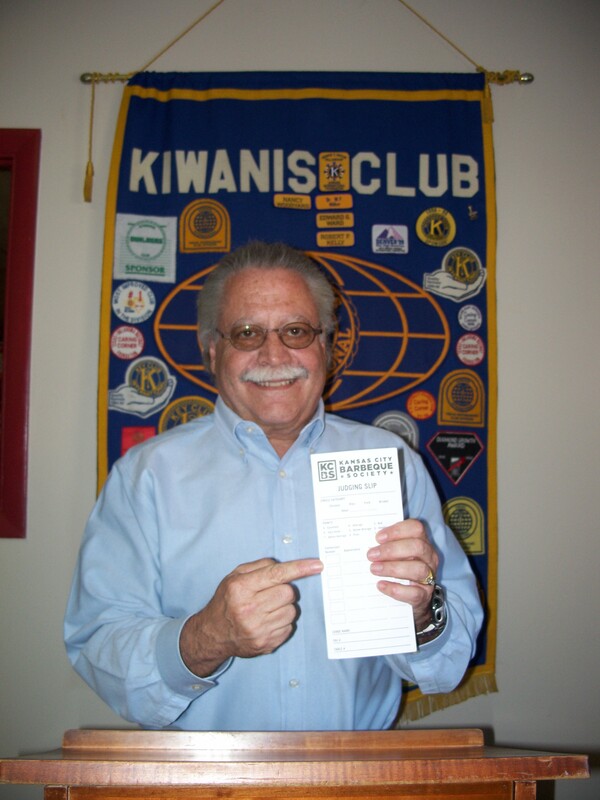 Professional barbecue judge, Merl Whitebook, visited the Pawhuska Kiwanis Club recently and shared “barbecue secrets” and “biggest mistakes” he has learned from being a certified barbecue competition judge. Those in barbecue competition know that the secret to better barbecue is adding margarine or butter, Whitebook confided. In addition, Whitebook said that his own secret ingredient was white pepper because it doesn’t compete with the barbecue flavor. “You taste it on the back of your tongue,” he explained. When grilling, “avoid salt — it dries out the meat” — and consider spraying the meat with apple juice, Whitebook said. Honey and herb and spice rubs also add flavor. This attorney and professional Barbecue Judge for the Kansas City Barbecue Society said that the biggest mistake people make in charcoal grilling is using a whole bag of charcoal. Instead, “use about a third of it,” Whitebook said. Also, don’t place coals all the way across the grill, he advised. “When you have coals all the way across, you’re fighting the top all the time,” he said. “Otherwise, you can move your meat off the heat.” His favorite charcoal is Ozark Oak. Whitebook explained how to tell when the meat is done. Briskets are done at “195 to 210 degrees,” he said. However, the way the meat feels is also important. When he checks the interior, he wants it “to feel like butter.” Once the meat is finished, there is another important step: “I smoke it for about an hour,” he said. One thing that is not commonly known outside the barbecue competition world is that in these contests “chicken is parboiled in margarine or butter and finished off over direct heat. The butter penetrates it and adds a lot of flavor,” he said. However, at home Whitebook does not parboil in butter because, although it adds flavor, it also adds significant fat and calories. Although there are things to learn from the world of barbecue competition, these techniques may not always be appropriate for home grilling. Barbecue competitions are judged on the grilling of: chicken, ribs, pork and brisket for: taste, tenderness and appearance “in that order,” Whitebook said. Some competitions also include side dishes. There are many barbecue competitions in our area, including one in May in Claremore, he said. The winnings can be impressive. “The team of the year won $50,000 this year. Sam’s Club is putting $100,000 in prize money this year,” Whitebook said. Currently, he serves as the Secretary for the Kansas City Barbecue Society and on the New Ideas and Nominating Committee. Sample plates of the barbecue competitors can be purchased at these events, so be sure to try one at the next competition in your area!